Where the Forest Meets the Stars by Glendy Vanderah has a very mysterious synopsis and some have compared it to The Snow Child. I thank TLC Book Tours for sending me a copy at no charge for my honest review. In this gorgeously stunning debut, a mysterious child teaches two strangers how to love and trust again. After the loss of her mother and her own battle with breast cancer, Joanna Teale returns to her graduate research on nesting birds in rural Illinois, determined to prove that her recent hardships have not broken her. She throws herself into her work from dusk to dawn, until her solitary routine is disrupted by the appearance of a mysterious child who shows up at her cabin barefoot and covered in bruises. The girl calls herself Ursa, and she claims to have been sent from the stars to witness five miracles. With concerns about the child’s home situation, Jo reluctantly agrees to let her stay—just until she learns more about Ursa’s past. Jo enlists the help of her reclusive neighbor, Gabriel Nash, to solve the mystery of the charming child. But the more time they spend together, the more questions they have. How does a young girl not only read but understand Shakespeare? Why do good things keep happening in her presence? And why aren’t Jo and Gabe checking the missing children’s website anymore? Though the three have formed an incredible bond, they know difficult choices must be made. As the summer nears an end and Ursa gets closer to her fifth miracle, her dangerous past closes in. When it finally catches up to them, all of their painful secrets will be forced into the open, and their fates will be left to the stars. Glendy Vanderah worked as an endangered bird specialist in Illinois before she became a writer. Originally from Chicago, she now lives in rural Florida with as many birds, butterflies, and wildflowers as she can lure to her land. Where the Forest Meets the Stars is her debut novel. Joanna is a field biologist studying the nesting behavior of indigo buntings. She is staying in a cabin in a rural area. She mostly keeps to herself as she is still mourning the loss of her mother and dealing with the aftereffects of her own cancer treatment. She has really only interacted with the man who lives nearby – he sells eggs on the side of the road a few days a week. Then one night a young girl appears out of the woods. She has no shoes and she claims to be from outer space. Joanna wants to call the police but the girl warns she will run away. She claims she needs to stay on Earth until she sees five miracles and then she will go back to her planet. Soon Joanna enlists the Egg Man to help with the young girl whom they start calling Ursa. They know that they should turn her in to social services but Ursa is like a will o’the wisp and runs whenever police are seen. It also seems that Ursa brings an aura of good luck that touches everyone in her orbit. But exactly what is Ursa’s reality? How did she end up where she was and where does she belong? Where the Forest Meets the Stars is mostly a book about relationships. Joanna had mostly withdrawn from the world after the loss of her mother. Gabe, the Egg Man is pretty much hiding away after a bout with depression. Ursa has her secrets and her ethereal manner pulls these two lonely people together and she helps to heal a lot of psychic wounds. I found the book and its various subplots to be interesting and the way it all came together at the end was a little contrived but it still made for a good read. There were some bits that just didn’t make sense at all – like two adults caring for a young girl not related to them and not really doing anything substantial to find her family – that really stretched reality. It’s one of those books that you just can’t let the rules of the real world interfere with what is going on in the story or it will just ruin things. Just read the book and go along for the ride. 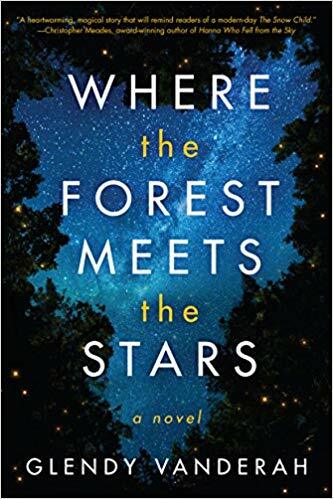 One lucky US reader will win a copy of Where the Forest Meets the Stars. Just enter as many ways as you would like on the Gleam widget below. Full rules are on the widget. Good luck everyone.